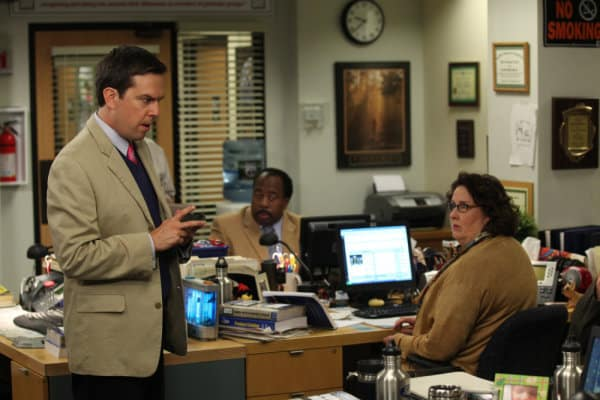 Pictured here, a scene from the season seven premiere: Ed Helms as Andy Bernard, Leslie David Baker as Stanley Hudson, Phyllis Smith as Phyllis Vance. 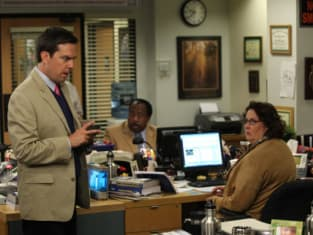 The Office Season 7 Episode 1: "Nepotism"
Michael: You don't have all the facts. Jo: How far has it gone? Everywhere I look it's Betty White this and Betty White that. Finally a kid who's not talking about Betty White. Of course I follow him.